The full utilization of solid waste—phosphogypsum (PG)—by reacting it with pyrite can not only produce acid but can also solve the serious issues associated with PG waste. However, this approach is limited because of crusting which blocks the rotary kiln and makes the acid production unsustainable. Hence, it is imperative to design a strategy to increase the eutectic temperature so as to prevent the generation of eutectic compounds, which always lead to crust formation, kiln-ringing, and blockage. 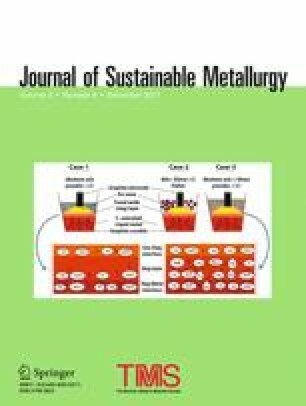 In this study, the fusion characteristics of pyrite reduction were investigated via the determination of ash fusion points under various atmospheres as well as using different additives. The structural changes and fusion characteristics, in particular macromorphology, were observed by scanning electron microscopy. Furthermore, the optimal conditions to increase the softening temperatures were determined by means of single-factor and orthogonal experiment methods. The online version of this article (doi: 10.1007/s40831-017-0138-0) contains supplementary material, which is available to authorized users. Financial support for this project was provided by the National High Technology Research and Development Plan (863 of China, 2011AA06A106), which is gratefully acknowledged.